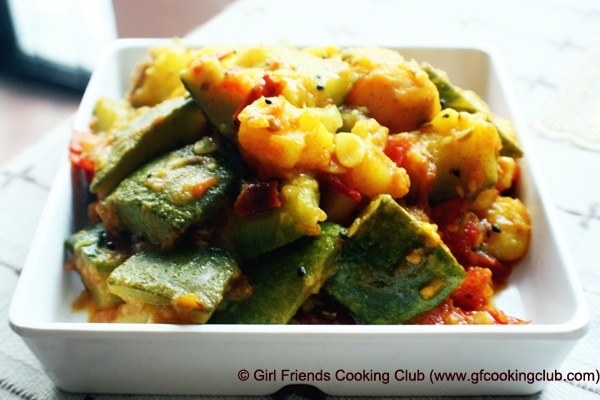 Chop the green pumpkin ( with the cover) and potatoes into medium size cubes. Heat oil in a pan and add the potato cubes and fry for 5 mins. Then add the cumin, fenugeek, black mustard seeds and dry red chillies and stir fry for 10-15 secs. Add the green pumpkin cubes,cumin powder, turmeric, chilli powder and salt.Mix well with the potatoes. Sprinkle a bit of water and cover and cook on low heat for 5 mins. Chop the tomatoes and add it on top of the vegetables (don’t mix it) , sprinkle a bit of water with your hand and cover and cook for 3-5 mins. With the steam, the tomatoes will become soft and mushy. Now, mix the tomatoes and the vegetables together and cook till the vegetables become tender. This entry was posted in Nepali Food Recipes, Vegetables and tagged Nepali Cuisine, Nepali Recipes, pumpkin by Kamakshi. Bookmark the permalink.